Try Continuous Ink System with your Epson Expression Premium XP-605 and make 30 times more quality prints for the same money! Pay only 0.04 USD for A-4 full color print! Print more, pay less! Thanks to CISS Epson XP-605 it's achievable! This construction considerably is worked out so that it can comes down the printing cost price but the quality of copies remains on the proper level. Continuous Ink Supply System Epson XP-605 CISS perfectly substitutes original consumables. The presented construction allows saving great sums of money on printing. The cost of any copy reduces in 20-30 times. The unique CISS system reduces the cost price of every printed text document or photo to the minimum. 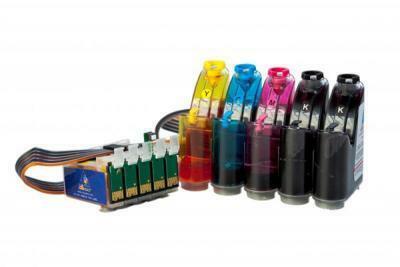 The price of each printout reduces many times in comparison with printing on original cartridges. Volumes of copies compose hundreds of thousands of copies. It's not easy to calculate when this system proves itself. You may order continous ink system Epson XP-605 on our web-site is easy and fast. On our web-site you can also acquire CISS epson nx420. System is made so that it provides the continuous printing. Ciss ink system Epson XP-605 is safe, the assembly is made on the perfect level. In addition to it, there is no need to change interior tanks consequently the printing head is secured against the air penetration. So an owner is protected against the risk that an important part of a multifunction device breaks down.